Can you Help? Many people are very busy and don’t have a lot of time to give to volunteer. Another way to help is purchase one or several of the books listed. Not only are you helping Colorado For Health Freedom, but you are also getting some great books in return! 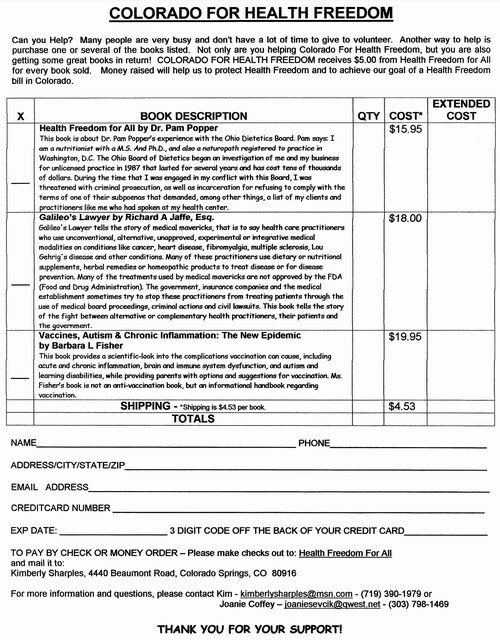 COLORADO FOR HEALTH FREEDOM receives $5.00 from Health Freedom for All for every book sold. Money raised will help us to protect Health Freedom and to achieve our goal of a Health Freedom bill in Colorado. This book is about Dr. Pam Popper’s experience with the Ohio Dietetics Board. Pam says: I am a nutritionist with a M.S. And Ph.D., and also a naturopath registered to practice in Washington, D.C. The Ohio Board of Dietetics began an investigation of me and my business for unlicensed practice in 1987 that lasted for several years and has cost tens of thousands of dollars. During the time that I was engaged in my conflict with this Board, I was threatened with criminal prosecution, as well as incarceration for refusing to comply with the terms of one of their subpoenas that demanded, among other things, a list of my clients and practitioners like me who had spoken at my health center. Galileo’s Lawyer by Richard A Jaffe, Esq. Galileo's Lawyer tells the story of medical mavericks, that is to say health care practitioners who use unconventional, alternative, unapproved, experimental or integrative medical modalities on conditions like cancer, heart disease, fibromyalgia, multiple sclerosis, Lou Gehrig's disease and other conditions. Many of these practitioners use dietary or nutritional supplements, herbal remedies or homeopathic products to treat disease or for disease prevention. Many of the treatments used by medical mavericks are not approved by the FDA (Food and Drug Administration). The government, insurance companies and the medical establishment sometimes try to stop these practitioners from treating patients through the use of medical board proceedings, criminal actions and civil lawsuits. This book tells the story of the fight between alternative or complementary health practitioners, their patients and the government. This book provides a scientific-look into the complications vaccination can cause, including acute and chronic inflammation, brain and immune system dysfunction, and autism and learning disabilities, while providing parents with options and suggestions for vaccination. Ms. Fisher’s book is not an anti-vaccination book, but an informational handbook regarding vaccination. SHIPPING - *Shipping is $4.53 per book.